The Pocahontas County Bike Ride (a.k.a. 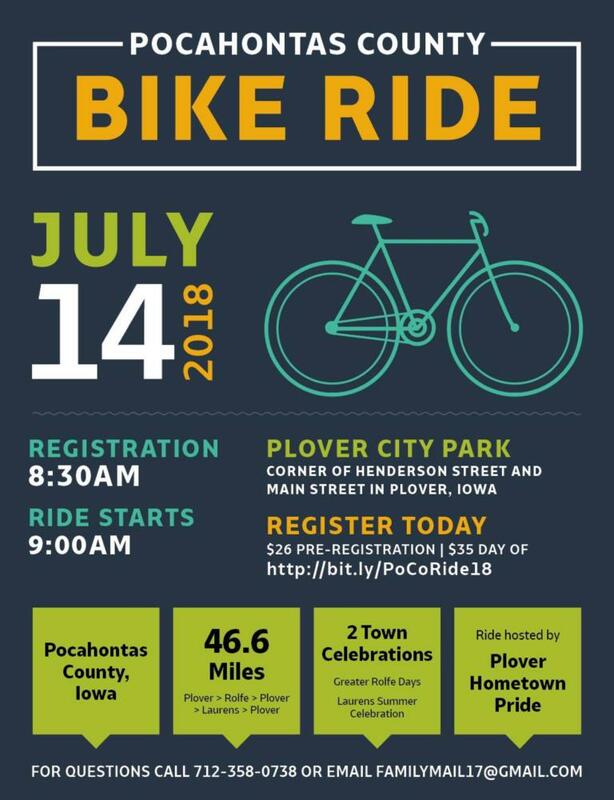 Plover Bike Ride) will be held July 14, 2018. Starting point will be at the Plover City Park at 9:00 AM. The route will be to Rolfe, circle back to Plover, to Laurens and back to Plover. This will be the same route as 2017. More details to follow. Call Janeice Garrard at (712) 358-0738 for more information. Registration fee is $26. This is a great conditioning ride. Held on the day of city celebrations in Rolfe and Laurens so riders can take in the town activities. We want 100 riders or more this year! Our community was included in the Karras Loop for 2017 so maybe you have been here before! attend. There will be railroad tracks to cross three times during the ride.